"Waikato is just cows and a river"
Home : News : "Waikato is just cows and a river"
Farms and river: a need to change Waikato's image? A new study released today by PR company BlacklandPR, shows that New Zealanders think Waikato is largely cows and a river, and it appears that locals think the same. 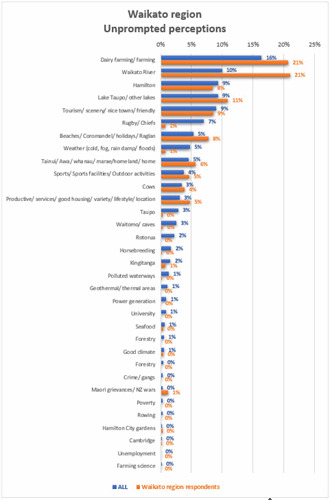 Unprompted, the one thousand participants were most likely to associate the Waikato with dairy or farming in general (16%), the Waikato river (10%) and Hamilton (8%). When prompted, 79% of New Zealanders are likely to associate Waikato with the river, and 66% with dairying. Greta Shirley, Director of BlacklandPR’s Waikato office, points out that locals are reinforcing the stereotype. Over ninety percent of people living in the Waikato associate the region with the river and 75% say dairying. The next strongest trait is Maori heritage (65%). “These are strong and positive traits about our home, but we’ve got to start talking about other things that reflect the modern region,” Greta says. 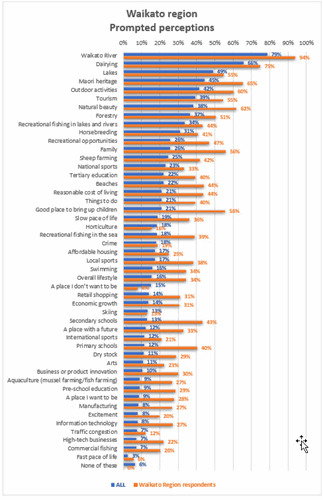 The next four highest traits locals associate with the region are all about family and lifestyle. Locals also rank the region higher than other New Zealanders for economic growth, a place with a future, business and product innovation, info-tech and high-tech business. (larger copies of these charts can be downloaded here). Greta says stereotypes are efficient shortcuts for people to understand things, but the current stereotype was no longer accurate. The study comes on the heels of a Waikato Regional Council report card that shows growth has improved in the region, but wellbeing factors have not. Life satisfaction, perceptions of safety, social connectedness, community pride, community engagement are all trending down. Greta says reputation and social factors should be part of discussions between business leaders at the Waikato REDA summit being held this week, aimed at determining initiatives and priorities that will drive economic impact for everyone in the Waikato. “Our reputation among the nation’s leaders is of a growing region, but they are not so aware of the stresses of the development. “If we want to drive economic growth and attract people to the region, we need to build a reputation for more than cows and water. There is so much more than that driving the Waikato’s success. “We also need to communicate what the region needs to support that, otherwise we won’t be able to keep up with the pace of change,” Greta says. Results are from a Horizon Research nationwide survey of 1000 adults conducted between 7-14 August 2018. Respondents were members of Horizon’s nationwide adult online research panel. The survey results (prompted and unprompted) are weighted by age, gender, personal income and employment status to represent the New Zealand 18+ population at the 213 census. At a 95% confidence level the maximum margin of error is +/- 3.2%.